Three iconic images make up our Peace Love Bird design. A peace sign, a heart and binoculars in silhouette form in colorful circles. 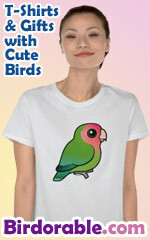 This makes a great gift for birdwatchers & peace-loving birders!